The dismal state of press freedom in Mexico has been a cause for concern in recent years, and it has been getting worse. Journalists covering the conflict among drug cartels and corruption within the Mexican government, are regularly threatened, attacked, and murdered in their quest to uncover the truth. The frequency of threats against journalists rose 20 percent from 2011 to 2012, and has risen by another 20 percent in the past four months. Mexican journalists investigating government corruption have also been deliberately silenced by government officials, and in response to mounting threats to their safety, often choose to silence themselves. While drug cartels are undoubtedly major perpetrators of violence against journalists, the dangers they present are exacerbated by a lack of institutional protection for Mexican journalists and the abysmal rate of prosecution of crimes against them. This is particularly true in cases where state government officials have been linked to drug cartels. But the government’s contribution to this problem go far beyond a weak and ineffective judicial system. ARTICLE 19 reports that in 2012 the government itself was responsible for nearly 44% of attacks against journalists. This is almost three times the frequency of attacks from organized crime groups. Ana Lilia Pérez, a Mexican investigative journalist now living in exile, confirms this, saying “it’s time to end this dishonest account that attacks on the press are from organized crime. My case comes straight from the state.” Pérez was in the midst of investigating the transactions of a state-owned oil company when she discovered ties between state officials and drug cartels. In the wake of these revelations, Pérez began receiving death threats at her home and work, had her telephone lines tapped, and narrowly escaped an attempted attack by government officers. Police effectively ignored Pérez’s reports of intimidation; in fact, she is now facing a lawsuit for defamation from one of the officials that she profiled in her work, Congressman Juan Bueno Torio. In Pérez’s case, one can see evidence of the ways in which impunity and state sponsored violence are often linked. Not surprisingly, Mexico has one of the highest ratings on the Committee to Protect Journalists’ 2013 Impunity Index, which measures the frequency with which journalist murders go unpunished. Crimes against journalists are rarely prosecuted in Mexico, and many state governments deny there is even a problem. When crimes against journalists are prosecuted, some of the cases have been highly suspect, as can be seen in the incidents cited below. Although Jorge Antonio Hernandez Silva was found guilty in the murder of former Proceso crime reporter Regina Martinez Perez in Veracruz, the investigation was riddled with inconsistencies. Fingerprints found in Ms. Martinez’s home did not match those of her alleged murderer, and Silva was allegedly tortured into confessing. On top of this, the Mexican government refused to acknowledge a relationship between Martinez’s murder and her investigations of drug cartels and their links to state government officials. Rather, robbery was cited as the official motive. While Ciudad Juarez was formerly a major site of attacks against journalists in Mexico, the city has seen improvements in recent years. The Eastern state of Veracruz, however, has become one of the epicenters of violence against journalists in Mexico. The Martinez case also shows how state cover-ups of connections between the narco-wars and journalist murders have reached the highest levels of government. Police and government officials in Veracruz allegedly planned to hunt down and seize another Proceso reporter, Jorge Carrasco, who questioned the investigation into Martinez’s death. It is not only journalists who are targeted as a result of their work, but also their family members. This is certainly the case in the recent murder of Alfredo David Paramo and Diego Alejandro Paramo. Both were the sons of two well-known journalists and they were intercepted in their car and killed by gunmen on May 5, 2013. 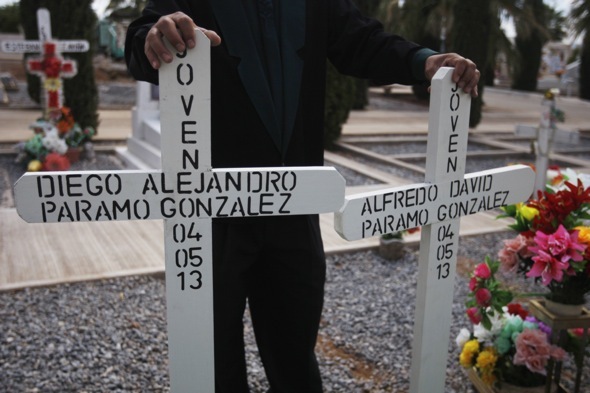 In this case too, Mexican officials denied a connection between their deaths and their parents’ work as journalists. The new Journalist and Human Rights Defenders Protection Law, instituted in October 2012, appears to have had little to no impact. In a recent report on the effects of the law for Mexican journalists, ARTICLE 19 outlined the many shortfalls and failures of the system as it stands. They concluded, “the current operation of the mechanism is underfunded, understaffed and thus unprepared to properly address the situation.” Furthermore, as government officers perpetrate many attacks against journalists, there is an understandable lack of trust in the state protection mechanism. One of the biggest challenges to the federal protection mechanism lies in gaining the cooperation of local authorities. In states where government officials are corrupt or linked to drug trafficking, police often try to deliberately sideline the investigation and are hostile to outside intervention. Federal agents struggle to walk a kind of tightrope, running their own parallel investigation as they try to avoid antagonizing crooked local cops. Attacks and threats against journalists inhibit an active free press in Mexico, which is integral to the development of a healthy democracy in the country. For this reason, as stated by Proceso reporter Marcela Turati, there needs to be a greater international media focus on the situation in Mexico, rather than a waning in attention due to the situation’s lack of improvement. It is, by now, well established that press freedom is ailing in Mexico, but this should not be a cause for inaction or defeat. Journalists in Canada and the U.S. could help Mexican journalists to publish the stories that desperately need to be told. Greater attention from other government leaders could put pressure on the Mexican government to undertake much needed reforms. The government must get its own house in order - routing out corrupt elements and building a new system that supports the rule of law, does not tolerate intimidation and attacks on journalists and makes it a priority to ensure that all journalists are able to work in safety. The converse - a growing number of Mexican journalists turning to exile - would be a very bleak future for press freedom in Mexico. The infographic below contains key statistics about the threats to press freedom in Mexico. Click on each icon for a link to more information about the topic at hand. Statistics can vary between organizations depending on what qualifications are used to define journalist “murder”; the facts displayed below are intended to convey the magnitude of the problem.